Here's which one of these 3D printing stocks currently looks like the better investment. While both Stratasys (NASDAQ:SSYS) and Proto Labs (NYSE:PRLB) are involved in 3D printing, they are quite different companies. Stratasys is one of the two largest publicly traded players in the industry, is rather diversified, and is a pure play on 3D printing. Proto Labs is considerably smaller, has a more focused operation, and just 13.6% of its total revenue was generated from 3D printing in 2016, though this business is growing fast. Both stocks have underperformed the broader market over the last five years, with Stratasys' stock in the red during this period. Stocks within the 3D printing realm have struggled since 2014 due to an industrywide slowdown in demand, but the space still has very attractive projected long-term growth dynamics. Our quest is to determine which of these two 3D printing stocks currently looks like the better investment. Stratasys' top management has generally executed solidly with respect to its enterprise business, in my opinion -- and certainly better than its primary rival, 3D Systems. However, in recent years, it's had some huge execution issues centered on its desktop 3D printing unit, MakerBot. In contrast, Proto Labs' top management has been executing solidly to very well for quite some time, without making any notable gaffes. If you share this opinion, you might want to put this category in Proto Labs' column. However, I'm calling it a draw because Stratasys has new top management since the MakerBot fiasco, in which a new 3D printer was released well before it was ready for prime time. The company has a new CEO as of July 2016 and a new CFO as of January of this year. It's a bit too early to judge how well Stratasys' new top management team is performing. Stratasys and Proto Labs have quite different business models and moats. Stratasys sells 3D printers and related hardware and software, sells printing materials, and provides on-demand 3D printing services for a wide variety of customers. It employs a razor-and-blade-like business model: 3D printers are the "razors" and materials and service contracts are the "blades." Sales of 3D printers generate recurring revenue streams from sales of materials and service contracts over the life of the printer. Proto Labs' business is 100% service-based; it does not sell 3D printers or any physical product. It's an internet-enabled, quick-turn contract manufacturer, producing custom prototypes and short production runs for customers in a wide range of industries. The bulk of its work -- about 86% by revenue in 2016 -- is performed using traditional manufacturing techniques. The company uses 3D printers and other production equipment made by many manufacturers at its sites. Currently, Proto Labs' business model appears to be the better one for the simple reason that its financial performance has been better. However, there's a good case to be made that Stratasys' business model itself is just as attractive -- razor-and-blade models can be quite lucrative when they're working well -- and that a primary reason for the company's subpar financial performance is that we're in the early innings of companies adopting 3D printing for anything beyond basic prototyping. I subscribe to this theory, so I'm going to call this category a draw. As to their respective moats to keep competitors at bay, Stratasys' is straightforward: It has proprietary technology that powers the 3D printers that it sells. If a customer wants to buy a new 3D printer powered by the highly regarded Polyjet tech, for instance, it has no choice but to buy it from Stratasys. Proto Labs' moat is less obvious, but quite strong: Not only does the company have a reputation for quality, but its turnaround time is very fast compared with that of its industry peers. I'm keeping this one simple. The bottom line is that Proto Labs is profitable and Stratasys is not, and hasn't been for quite some time. The good news is that Stratasys' earnings are on the upswing, even though they're still negative. 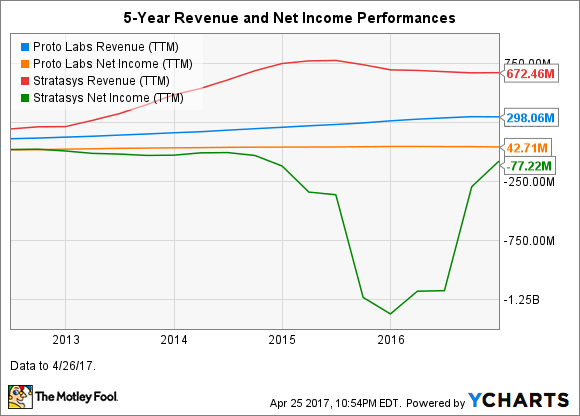 Profitability probably isn't around the corner, as the company expects to remain unprofitable on a generally accepted accounting principles (GAAP) basis in 2017. However, the company does have a positive free cash flow (FCF). Currently, Proto Labs appears to be the better investment, without even considering stock valuations. Though at least one key valuation metric that I favor supports this conclusion: Proto Labs' stock is valued at 34.1 times trailing-12-month FCF, whereas Stratasys stock's price-to-FCF ratio is 86.6. That said, Stratasys has the potential to be just as good an investment, or perhaps even better. Within the next year or so, investors should get a clearer picture of two key factors: how well Stratasys' top management is executing in general, and how much of a competitive threat is presented by HP Inc. and venture-funded Carbon, both of which entered the market last year by launching compelling, speedy 3D printers.